Fed Ex just dropped them off! 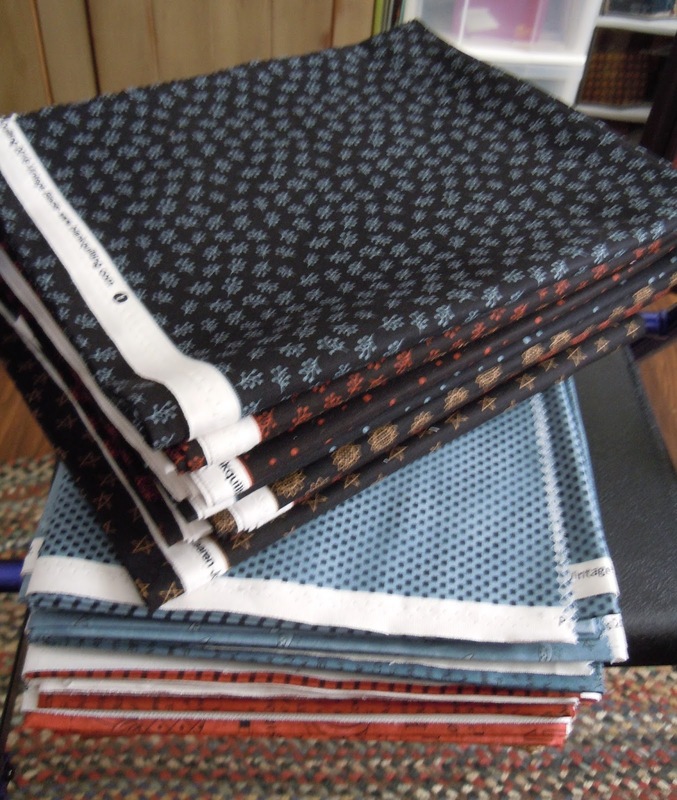 The strike offs or production samples for my first two fabric collections, A Vintage Autumn and Vintage Blacks are now sitting in my sewing studio. Now that I see them in person, I'm even more OVER-THE-MOON excited!!! I'm thrilled with both the color and quality of the fabric. The quality is second to none and will be a pleasure to work with. The three main color groupings are a deep rust (not as orange as in the above photo), a steel-ish blue, light and dark taupes/tans and blacks that read a TRUE black and not a blue-black. 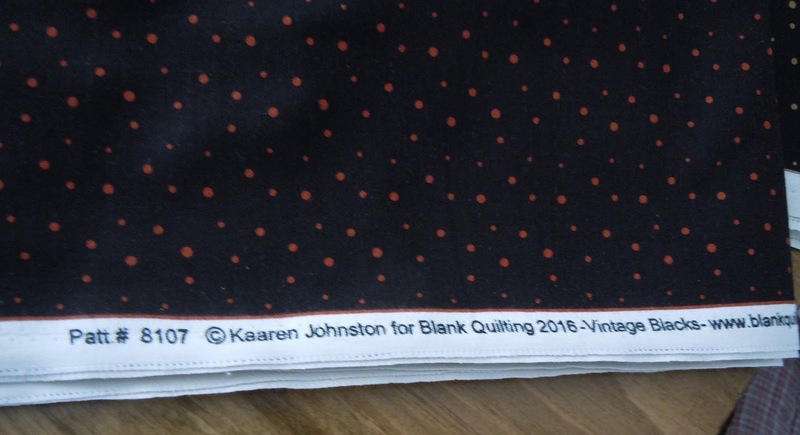 They ship from the Blank Quilting warehouse in April so keep an eye out for them in your local quilt shops! My house quilt is officially a flimsy! The finished size is 74" x 86" and the blocks finish at 10". I'm so sorry for the yucky photos but I can't seem to find floor space large enough to allow my house flimsy to lay flat, hence all the wrinkles. I VERY seldom make two of anything but I think I'm going to make another, perhaps a scrappy red and white one... but not until I get this knee taken care of. I'll be seeing my family doctor next week and I'm going to ask her for a cortisone shot. Every time I look at this quilt from now on it'll remind me of the pain I "HAD" to endure while making it. 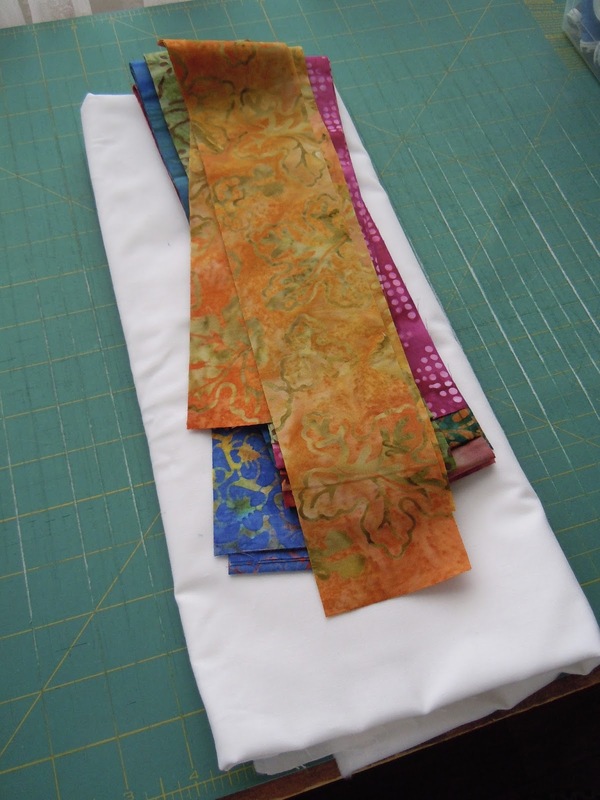 Thank goodness for the stop/start button on my machine or I'd never have been able to finish it! But that's okay because the hand work on my Brinton Hall quilt has been waiting patiently for my return. My knee is feeling much better and as a result, I've managed to accomplish everything that was on my 'to do' list. Thank you all for your thoughts, prayers and words of encouragement. I did take it easy for a couple of days and coupled with using the stop/start button on my machine as well as changing the location of my foot pedal so that it's nearer to me seemed to ease the pressure on my knee and appears to have done the trick. If it persists, I'm going to ask my doctor about getting a cortisone shot. in addition to the one hundred and sixty-four hexies to complete the center medallion for my Brinton Hall quilt. 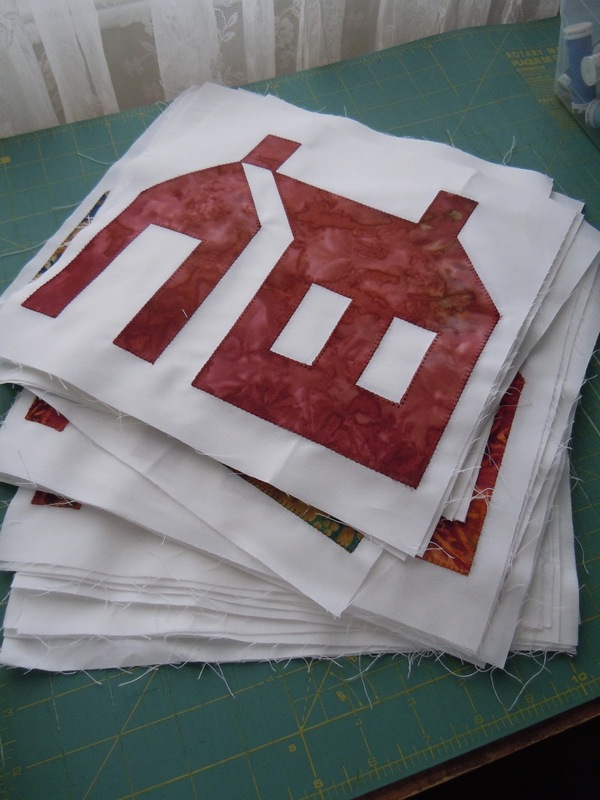 I'll be spending the afternoon cutting out copious amounts of sashing strips and cornerstones. Then, let the piecing begin! I know it's been a while but I've been having some health issues again. Golly, you must be as tired of me mentioning them about as much as I am. I'm not going to go into the sordid details but if you are so inclined, please keep me in your thoughts and prayers as we weather yet another blip on the radar. I've been trying to keep myself busy both at the sewing machine when my knee will allow it and with hand work when my knee won't cooperate. Thanks to a couple of friends, I "rediscovered" the stop/start button on both my machines and this has helped somewhat in that I don't have to use the foot pedal but it does take a little getting used to. 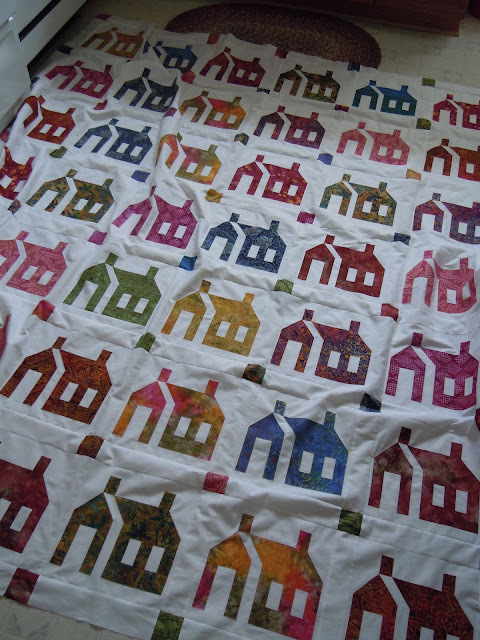 When the pain in my knee subsides, I've been working at machine blanket stitching the houses for my "village" quilt. 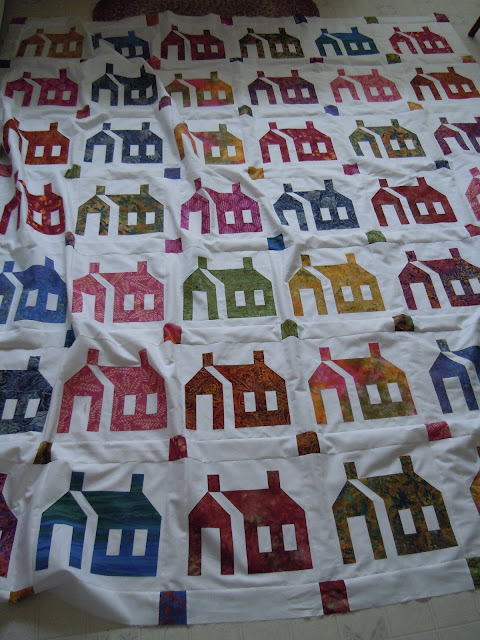 Forty-two houses will be included in my quilt village...and that's a lot of machine sewing for a gimpy knee! Over the past couple of days I've been trying to complete three or four blocks a day and at last count, I have ten more to go and then I can start to assemble the flimsy. 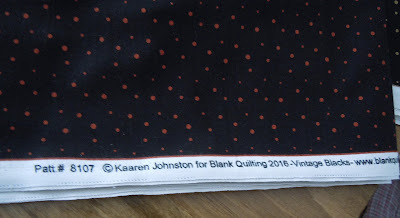 I'm sure that I've mentioned this before so you are all probably aware that I'm NOT a batik kind of gal, but the person who I'm making this quilt for is, hence the choice of fabrics. It's not that I don't like them...after all, I'm a child of the sixties who loved the tie-dyed look back then...but they're just not me now. And when the pain in my knee becomes too much to handle, I work on making the 164 hexies that are required for the next border for my Brinton Hall quilt. I should be finished those either later today or tomorrow which will allow me to move onto the next step in order to complete the center medallion. I saw my first Mr. and Mrs. Robin in our backyard this morning, a sure sign that spring cannot be too far off. We had a dusting of snow the other day which is almost all gone so they'll be able to forage for their worms and berries with ease. By the time I got my camera, they had flown away, probably back to their nest building. One last note and that is I hope that those of you who have asked me questions to which I've not replied are wondering why I haven't. Honestly, it's not because I don't want to but it's because I can't. You've come up as a "no-reply" blogger which means that you haven't included your email address in your profile when you set up your account and if it's not there, I have no way to contact you. Deborah Smith, I would love to answer your questions so what I'd suggest is for you to email me directly by clicking on the little vintage-looking post card on the right sidebar of my blog. I look forward to hearing from you. Time to go and give the chilli that's simmering on top of the stove a little stir. Sure smells good in here!